Crucible perform an exciting mix of energetic tunes, rich and evocative harmony singing and subtle accompaniment for a unique programme of English traditional material, ably complemented by their own compositions in the same style. 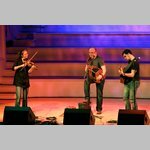 They combine three joyfully distinct voices with a range of traditional instruments, including fiddle, melodeon, guitar and cittern. Members of the band have many years’ experience with dance bands GloryStrokes, Hekety and new projects Melrose Quartet and Albion band.